The Start Your Own Bar Manual from Clint Newsom's Bar Owner Basic Training Program. Up until now, if you wanted to open a bar, it was hard to know where to start or even how to begin. Now, there’s a dependable way to learn. Starting your own bar can be a very complicated process that will in turn require you to make many important decisions. With the guidance offered in “Start Your Own Bar”, you’ll be able to make good decisions. Good decisions will set you up for success. 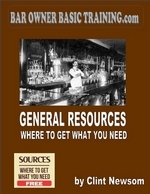 “Start Your Own Bar” is the cornerstone manual of the Bar Owner Basic Training web-site. All the other manuals flow from this manual. “Start Your Own Bar” will walk you through the process of determining if you are right for owning your own bar. Are you built for dealing with the public? Can you handle the long hours? “Start Your Own Bar” explains how to develop a concept that makes sense in your market. How to do meaningful market research you can rely on. Then how to determine what is needed in your market and what is not needed. Through an in-depth process, you’ll learn how to accurately estimate the actual cost of starting your bar. You’ll learn how to identify all the various costs from remodeling, furniture, fixtures, equipment, licensing, and much more. No stone goes unturned. The ultra-important task of estimating sales and expenses is explained in detail. Many beginners set themselves up for failure by getting this one thing wrong. Finally, you’ll learn how to put all of that information together to determine if you have a viable concept. Policies, programs, and philosophies that are critical to your success are introduced and discussed at length. You’ll have the advantage of valuable planning and preparation that most beginners never consider. “Start Your Own Bar” is the most complete guide available and will help your dream of bar ownership come true. Check out the free preview located to the right..
Click on the link below for the "Start Your Own Bar" manual that will best suit your needs.